Saturday 10:00 A.M to 1:00 P.M.
At Able Body Shop our number one priority is the relationship we develop with each one of our customers. 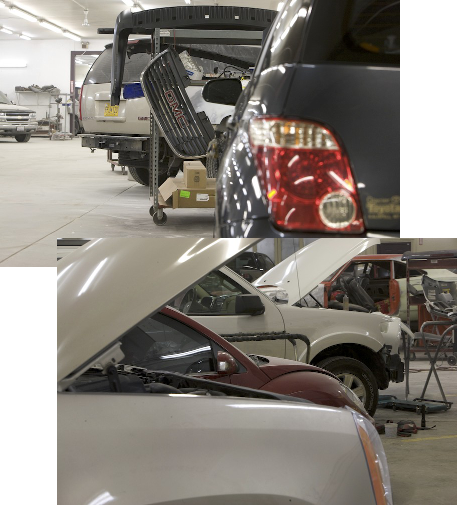 We recognize the inconvenience and stress involved when your regular daily routine is interrupted by the necessity for auto body repair, and we are committed to making the process easy on you from start to finish. All Able Body Shop repair work is backed up by our lifetime limited warranty for as long as you own your vehicle. We guarantee that the repairs we perform on your vehicle will be free from defects in material and workmanship under normal use and service or Able Body Shop will repair or replace the defective repairs at no cost to you. At Able Body Shop, our goal is to earn your trust and satisfaction by restoring your vehicle to its original performance and beauty. 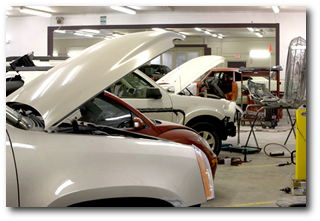 Our technicians are fully trained and have extensive experience in meticulously repairing vehicles to meet their original factory specifications. We stay ahead in our industry by using today's leading technologies. These include computerized estimating programs with digital imagery equipment, as well as precision frame and alignment equipment which guarantee that we'll bring your car back to factory specifications. And our employees undergo year-round training to keep their skills honed to meet the strictest standards of our industry. 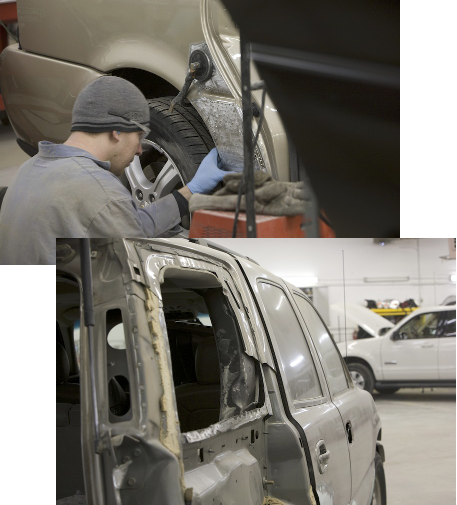 As evidence of our commitment to using the most sophisticated technologies available today, we're excited to announce that Able Body Shop has been chosen by PPG Paint -- one of the top manufacturers in the paint industry -- as the first repair shop in Montana to switch to a new, eco-friendly waterborne paint application system. The new system is part of our commitment to keep Able Body Shop "green" for our environment and the safety and health of our employees. When your vehicle arrives at our shop for repairs, we rinse it off in order to inspect the damage. 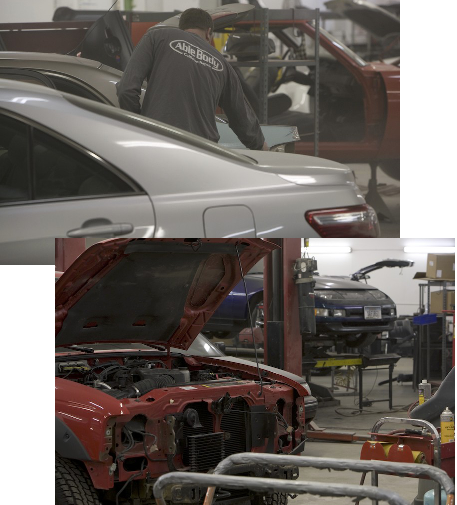 We also begin to disassemble the damaged area to inspect for sheet metal repairs and parts replacement to ensure the utmost accuracy in our estimating process. We'll keep you informed on the status of your vehicle repairs by phone or email - whichever you prefer. Once repairs are underway, if we discover more damage than was originally estimated, we take photos of the damaged area and contact you and/or your insurance company for approval to make the needed repairs. Once the repairs are complete, a damage appraiser will meet with you to review the repair process and make certain you're satisfied with our work. 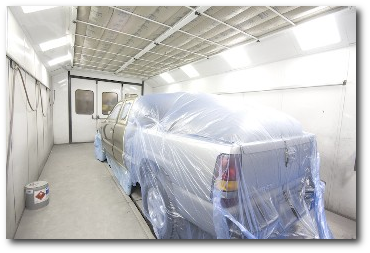 If you have insurance, you will need to meet your required deductible which is payable to Able Body Shop and is due upon completion of repair. Any other costs are unique to your particular insurance plan. We will contact your insurance company to take care of all required paperwork and documentation. Every repair is unique in nature and repair times will vary dependent upon how many labor hours are involved and the extent of damages. The estimator can give you an approximate amount of days to repair based on visual damages but there can be delays if hidden damage is discovered upon repair. What if I need a rental? Is that included in my repair costs? This can sometimes be covered by your insurance depending on your plan. If not, we work with local rental companies and can suggest the most affordable rental for your needs. We can also provide in-town commute when you drop your car off and in-town pickup when your car is ready upon your request. Able Body Shop offers full-service 24-hour towing and can accommodate most vehicle makes and models. We have both a traditional style tow truck as well as a flatbed recovery truck. We can tow your vehicle directly from the accident scene if needed; just let the law enforcement officials at the scene know that you want to bring your car to us. If your vehicle is out of our area, we'll make all the necessary arrangements to have it brought to us by another towing firm. Through Able Body Shop's full-service glass department, we can handle all of your windshield repair or replacement needs. And if you have your windshield replaced or repaired in our shop, we'll repair any rock chips you get in the future, for the life of your windshield. Our automated car wash begins with a manual prep by one of our technicians. Our state of the art wash bay is a touch-less, brush-less, high power wash system. We followup each wash with a manual wipe down.